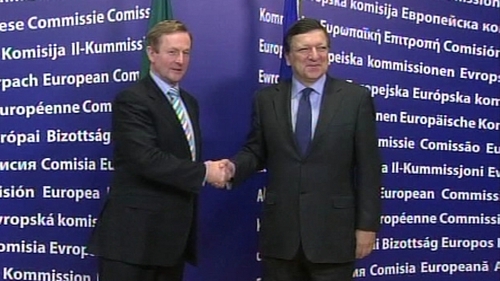 Taoiseach Enda Kenny has held 'positive and frank' discussions with European Commission President Jose Manuel Barroso in Brussels. A spokeswoman said that during the hour long meeting, President Barroso expressed an understanding that the interest rate on the Irish bailout was a major issue for Ireland and said the Commission supported Ireland on the issue. The President said he took note of Mr Kenny's inaugural speech - particularly his reference to honesty being the best policy. It is understood President Barroso also referred to the importance of getting to the bottom of the difficulties in the banking sector. The Taoiseach Enda Kenny has rejected any concessions on Ireland's corporate tax system in advance of a key summit of eurozone leaders in Brussels tomorrow. There were reports suggesting that the German Chancellor Angela Merkel was prepared to ease the burden of Ireland's bail out terms. The reports indicated that the easing of the terms were conditional that Ireland compromised on the corporate tax base issue. Mr Kenny has said that any changes to the tax base were an attempt to reduce our corporate tax rate through the back door. Minister for Foreign Affairs Eamon Gilmore earlier held a phone conversation with Catherine Ashton, the EU's High Representative for Foreign Affairs. The two discussed the current crisis in Libya and wider issues on the Middle East. They will hold a bilateral meeting at the informal meeting of EU foreign ministers in Budapest on Saturday. Before departing for Brussels this afternoon, the Taoiseach revealed the details of the 15 junior ministerial portfolios, with nine for Fine Gael and six for Labour. The new Government decided to cut ministerial pay and to seek savings on ministerial transport at its first meeting last night. After receiving their seals of office from President Mary McAleese, ministers attended their first Cabinet meeting in Áras an Uachtaráin. 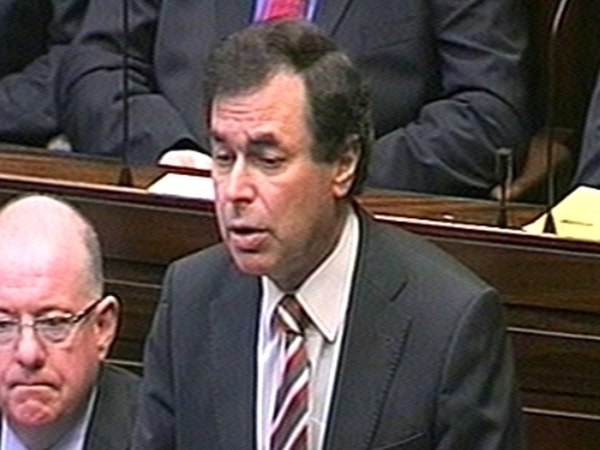 It was decided that the Taoiseach's pay is to be cut from €214,187 to €200,000, with other rates cut in line with that. Tánaiste Eamon Gilmore's pay is cut from €197,486 to €184,405. Ministers' pay has been reduced from €181,283 to €169,275, while pay for Ministers of State is cut from €139,266 to €130,042. The Cabinet also instructed the Departments of Justice and Transport, as well as the Office of Public Works, to come up with proposals within a fortnight to reduce the cost of ministerial transport. Meanwhile, State workers could be offered redundancy under plans to overhaul public sector, according to the new Minister for Public Expenditure and Reform Brendan Howlin. He said most public servants wanted to see reform.